Intrinsically faint, brown dwarfs have been more elusive and difficult to study than stars. Although they are often portrayed as exotic creatures as a result, brown dwarfs are actually far more numerous in our Galaxy than stars like the Sun. The discovery, accepted for publication in the Astrophysical Journal, supports the emerging picture that brown dwarfs form similarly to stars. The image shows the jet, HH 1165, launched by the brown dwarf Mayrit 1701117 in the outer periphery of the 3 million year old sigma Ori cluster. 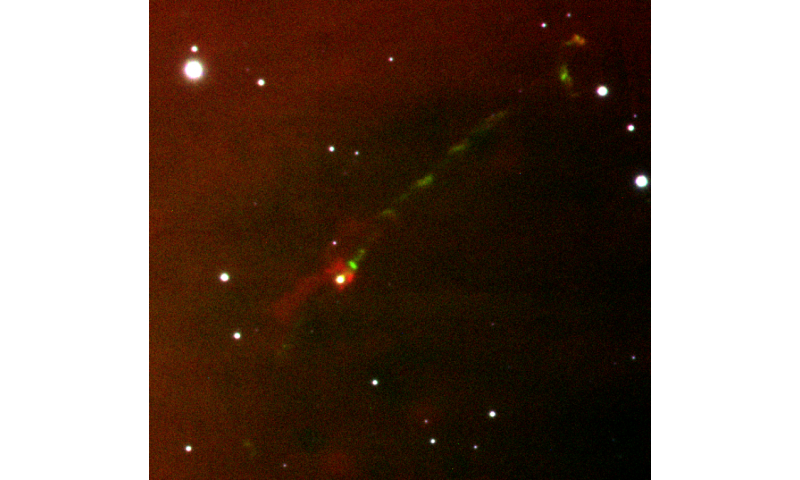 Traced by emission from singly ionized sulfur, which appears green in the image, the jet extends 0.7 light years (equivalent to 0.2 parsecs) northwest of the brown dwarf. The emission knots along the jet reveal that the mass loss is time variable, probably a result of episodic accretion onto the brown dwarf. The red nebulosity southeast of the brown dwarf is a reflection nebula that traces the outflow cavity in the direction of the counterjet. While outflows have been detected previously from young brown dwarfs, the earlier detections were of "microjets" 10 times smaller in extent. "Our result shows that brown dwarfs can launch parsec-scale jets similar to those from young stars," explains Basmah Riaz, who led the study. 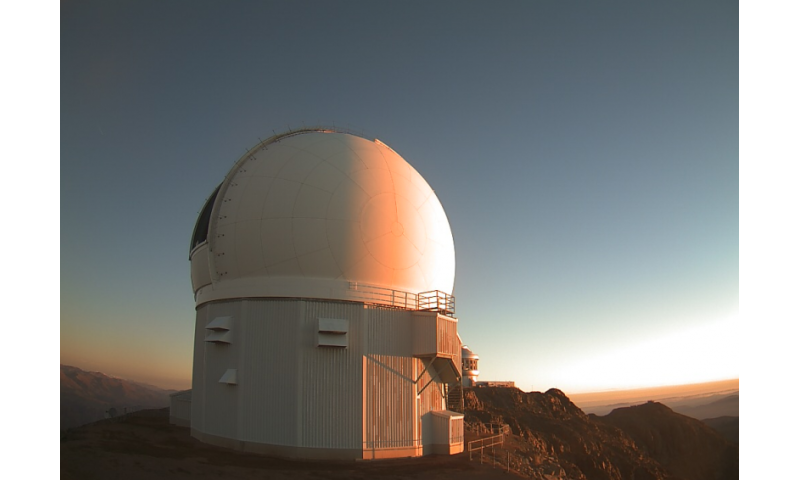 The image, taken with the SOAR telescope using the SOAR Adaptive Optics Module, was obtained in several hours of integration time. As described by co-author Cesar Briceno: "We could see the surprisingly extended jet emission after the first 30 minutes of integration. It was a real 'Wow' moment!" For some time, astronomers have suspected that brown dwarfs form much like stars. Like stars, brown dwarfs are known to be surrounded by disks at birth and to build up their masses by accretion from molecular cloud cores. The current discovery goes a step further and shows that, like stars, brown dwarfs launch powerful jets and that they build up their mass through an unsteady, episodic process. "The HH 1165 jet shows all the familiar hallmarks of outflows from stars: emission knots, a cavity with reflection nebulosity, and bow shocks at the ends of the flow. It checks all the boxes quite convincingly," commented co-author Emma Whelan. While it may seem counterintuitive that mass loss (in a jet) is an integral part of how an object grows or gains mass, this situation may arise because of excess angular momentum. When spinning skaters pull in their arms, they spin faster as a result of conservation of angular momentum. Similarly, when large, slowly rotating molecular cloud cores collapse, they may spin up too fast to squeeze down to the much smaller sizes of stars. Riaz speculates that indeed "Molecular cloud cores have much more angular momentum than can be contained by stars or brown dwarfs. So the system needs to lose angular momentum for the object to grow in mass. By removing angular momentum from the system, jets help solve the 'angular momentum problem' faced by stars as well as brown dwarfs." To test this hypothesis, the team is on the hunt for more extended jets from brown dwarfs, to understand how commonly they occur. Realize that what has actually been observed -- by Herschel, in particular -- is multiple young stars forming along branching filaments (much like ball lightning forming along a terrestrial lightning bolt). So, is it really appropriate to simply assume that it is the stars which form the jets? If that were the case, one would imagine that the jets/filaments would not so coincidentally connect up together, no? Be careful not to extrapolate Plasma Universe 'views' beyond 'domain of applicability', ok? You've become an ego-tripping troll now, FSC? You just ignore 'inconvenient' reality in order to try and 'save face' (because mainstream discovery/reviews have recently been confirming I am the one more in keeping with the objective reality; whereas you/your 'gang' of incompetent 'just believe orthodoxy' trolls keep 'believing' BB/Inflation etc etc myths are 'objective realities'). Did you not learn anything from your Bicep2 'just believe crap' fiasco, FSC? Will you take ego-tripping nastiness/denial to your grave just because I have been the one correct on many fronts all along while you trolled and insulted me? Wake up, FSC; to your personal/confirmation BIASES, before you die nasty/ignorant of objective reality; 'in denial' that BB/Inflation/Exotic-DM etc HACKS 'passed' an 'incestuous' 'peer review' system which BETRAYED reality-based Science Method. The link below highlights many of the things you have ignored/denied and/or misunderstood about me/my years of pointing out developing insights/science during your years of unheeding/insulting kneejerking wastes of time and intellect. Please go read the article fully. It is from a small astronomical/cosmological observational team of researchers who ACTUALLY DO scrupulously apply the OBJECTIVE Scientific Method principles; which latter I ALSO have been applying since age 9; and which you/gang here, and majority of mainstream 'professional/hack contributors/papers' and 'peer reviewers' at large, seem to have dispensed with long ago, and still are in many cases to judge from your continuing 'denial' and insults against perfectly correct science insights/contributors here/elsewhere! Have you actually read the article you link? Pavel Kroupa believes in a MONDian explanation for the DM effect. He does not claim, as you do, that the effect does not exist. Obviously I have. Have you, RNP? See how your 'reading confirmation bias' is strong in you, RNP? If you have been actually reading/understand my posts you would have known that I acknowledge the 'orbital regime' anomalies, and have pointed out the causes of them; which causes do NOT include the alleged 'exotic' DM 'interpretations' now being increasingly falsified by recent mainstream discovery/reviews in astro/cosmo observations/data. Moreover, the linked article also acknowledges the 'orbital regime' anomalies, just as I do. But MOND merely 'adjusts' the Newtonian' Maths-based algorithms for calculating the gravitational strengths versus radial distance in certain cases. "new discoveries of ORDINARY matter in HUGE quantities EVERYWHERE and in all sorts of states and all sorts of scales/distributions, implies that NO 'dark Energy' OR 'exotic dark matter' are needed AT ALL to explain motions/lensings observed"
"Time to stop the personal feuds/arguments based on OLD assumptions/arguments which recent astro discoveries/reviews have made OBSOLETE due to the NOW-SEEN but ORDINARY Baryonic/Fermionic matter within, between galaxies/clusters/superclusters at all scales"
"There is enough visible matter and more-to-be-found matter to explain the GR/Non-Keplerian behaviour"
These claims are in *direct* conflict with Kroupa's article which indicates that normal baryonic physics can *NOT* explain the observations. The quotes above also prove that you have *not* been extolling MOND all along, so your suggestion that Kroupa agrees with you is again dishonest. - We DO AGREE 'exotic' DM is NOT the 'answer'. So, RNP, please be try to distinguish/understand properly the subtle but important points; so as NOT to confuse/conflate by lax or 'confirmation biased' reading which 'morphs' it all into your 'straw men'. There is nothing wrong with my reading comprehension. However, confusion is bound to arise when someone quotes an article saying it agrees with what he's been saying "all along", but then, when pinned down, says he actually disagrees with the *central premise* of the article and he was only talking about a detail or two. I would also like to see your comments regarding these "anomalies" and can not find them on phys.org. Can you supply a link? (I'm betting not). Your continued insistence that normal baryonic physics can explain the dynamics of galaxies and galaxy clusters without being able to provide a shred of real evidence is yet another form of dishonesty. Why appropriate such biased subjective, reality-denial 'attitude' when there is the objective reality-seeking scientific method to follow? Since you don't follow it yourself - why are you asking him to? That's the thing: you're not doing that. You're just crying "it's wrong", but whenever someone asks you to actually provide a cogent argument why you think it's wrong you duck and weasel and hop over to another thread to endlessly repeat this cycle. You know what we call someone who does that? Yep. A troll. So go troll some other site. You never contribute anything. You're a complete waste of bandwith and oxygen. However, confusion is bound to arise when someone quotes an article saying it agrees with what he's been saying "all along", but then, when pinned down, says he actually disagrees with the *central premise* of the article and he was only talking about a detail or two. I would also like to see your comments regarding these "anomalies" and can not find them on phys.org. Can you supply a link? (I'm betting not). They cover many (not all) of the points/flaws/insights etc I've been pointing out for YOUR benefit. That's the thing: you're not doing that. Let's see, @antialias. YOU/gang FELL hook-line-and-sinker for that Bicep2 crap because you 'just believed authority/source', against the reality obvious to me (who did NOT fall for that Bicep2 crap and tried to warn YOU/gang NOT to 'just believe' it). Yet you STILL have the DISHONESTY to impugne MY honesty/objectivity? Despite mainstream increasingly confirming ME correct on what I HAVE pointed out for YOU/gang? I post CORRECT science/insights, but YOU/gang TROLLED, LIED, SABOTAGED, IGNORED it all. YET YOU/gang keep pretending 'it never happened'! Like you keep pretending YOUR/gang's pathetic Bicep2 (and BB/Inflation/'exotic' DM etc) FIASCOS 'never happened'! Do you ever learn, @antialias? Let's recap: You say basically *everything* repoted on phys.org is wrong. So you lucked out. Bravo. You just guess with a shotgun approach and when you hit once in a blue moon you say 'looka here'. If you think that approach gives you any cred...oh boy...you are fooling yourself so hard it's unbelievable. If anything it destroys any cred you ever thought you had. You say basically *everything* repoted on phys.org is wrong. So you lucked out. There you go, lying/tolling again, @anti. Do you even realize you're doing it? Ego is your 'master'; get it under control, @anti. Anyway, I point out errors/correctness BOTH as the case may be. But YOU/gang MISS IT ALL due to 'confirmation bias', personal bias, ego-tripping 'blinders', making stupid/malicious tactics/attacks in LIEU of ACTUALLY READING/LISTENING OBJECTIVELY. But you haven't been objective, so you missed it all; and pretend 'it never happened'; and keep attacking/trolling/lying to 'save face' against me (who urged you/gang to be objective/fair in dealing with others here, especially those posting correct science/insights/reminders for YOU/gang). We've all looked up and down physorg for any post of yours where you actually posted the reason. Nothing doing. It should be easy for you to restate the numbers you calculated - right? But instead you will again duck and weasel. Me...lying? Don't have to. I just have to reference all your (and my) posts. Seems pretty obvious (if nothing else from the ratings) who's lying, here. The "numbers" mean nothing (worse, GIGO) if PREVIOUS METHODOLOGY/THEORY/INTERPRETATIONS etc were FLAWED. So drop your "give me numbers" strawman, hey? The REAL PROBLEM: Previous unscientific/metaphysical NOTIONS/SPECULATIVE on which 'interpretations' were BASED; were NOT 'scientifically sound' from the get-go. Mainstream NOW confirming MY points made about previous naive/erroneous 'myths' built into BB/Inflation/exoticDM etc 'interpretations of observations narratives'. - Penrose recently SELF-CORRECTED and bravely/honestly renounced BB notion/metaphysics/claims. - Steinhardt et al recently SELF-CORRECTED and bravely/honestly renounced INFLATION notion/metaphysics/claims. - And NOW a TRULY OBJECTIVE astronomical observations group ALSO confirmed me correct on many points I have LONG posted for your edification (see link earlier to FSC/RNP).